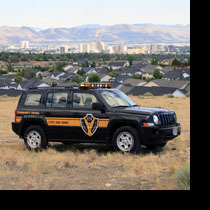 The ESI patrol inspection service comes with our highly visible marked patrol vehicles, uniformed officers, and ESI patrol signs posted throughout your property to further increase our presence. Our patrol cars provide a professional image that conveys authority and further deters criminal activity. While the patrol officer is on each property, they will drive around the property in the patrol vehicle with lights flashing. The officer will check any areas of concern, and will conduct foot patrols throughout each inspection to provide maximum visibility, thus discouraging trespassers. The officers will check in with our full service dispatch center, reporting activity on each site as well as utilizing our DEGGY electronic tracking system. Officers are in constant radio communication with our dispatch center and tracked using our Networkfleet GPS technology. The DEGGY electronic tracking system ensures that each area has been checked and allows the information to be transmitted to our dispatch center. The Networkfleet GPS technology monitors the officers movements and rate of speed while they are driving ESI patrol vehicles.